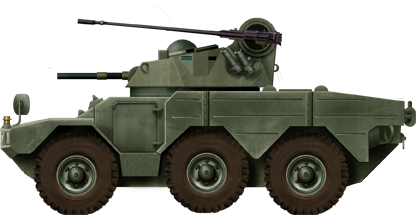 The previous Panhard AML, a small 4×4 developed in the 1960s was a big hit on the export market and proved itself in battle, but its low-pressure 90 mm gun was no match for most MBTs but at close range and targeting weak spots. At the same time, the Army left a requirement for a replacement for this vehicle, that would be attached to the concept of armed reconnaissance, and required a 6×6 vehicle, to muster heavier firepower. Design started at Societe de Constructions Panhard et Levassor in 1975. Both the ERC and VCR were developed from the same chassis, just like the previous AML/M3. 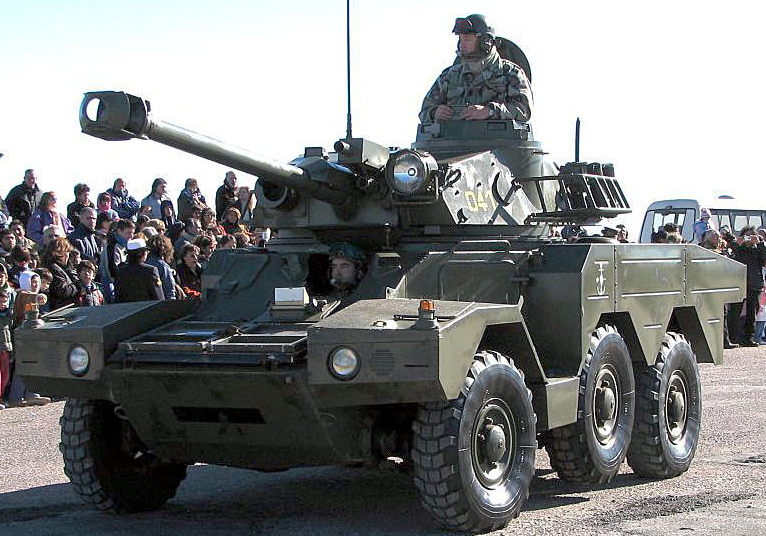 Argentine Marines Panhard ERC 90 Lynx. 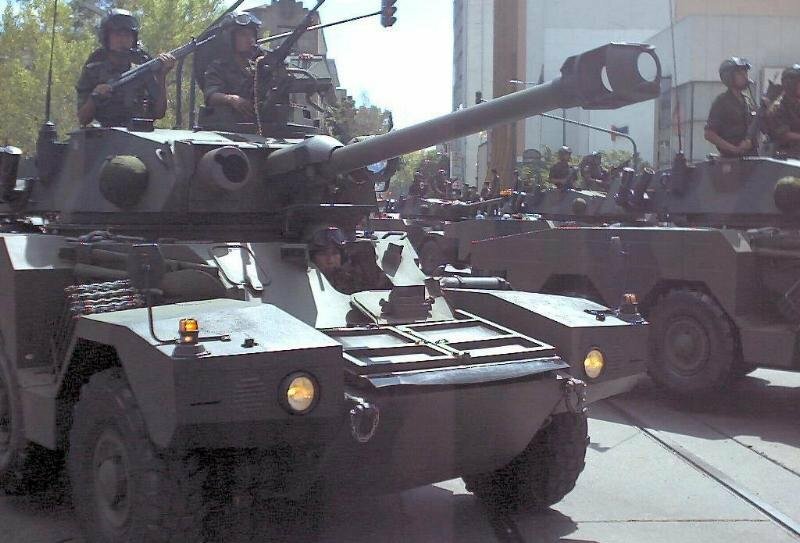 The oldest in service (1979), these vehicles had been deployed to patrol the very long border with Chile. Wikipedia states some had been deployed at Port Stanley in 1982 and saw action, but this could not be confirmed. It is generally accepted that was the case for the AMLs. ERC meant “Engin à Roues, Canon” or “gun armed wheeled vehicle” and shared many components with the VCR for lowering cost and make the formula still attractive on the export market. Despite this the ECR was a bit costlier, but also more capable machine. Its 6×6 configuration allowed it to be mobile even if one of the wheels was destroyed, while it lowered ground pressure and allowed to mount a heavier gun. However, two versions of the ERC were built ultimately, the cheaper “light” reconnaissance variant Lynx and the recce/tank destroyer version Sagaie (“assegai”), armed with the long barrel 90 mm F4. 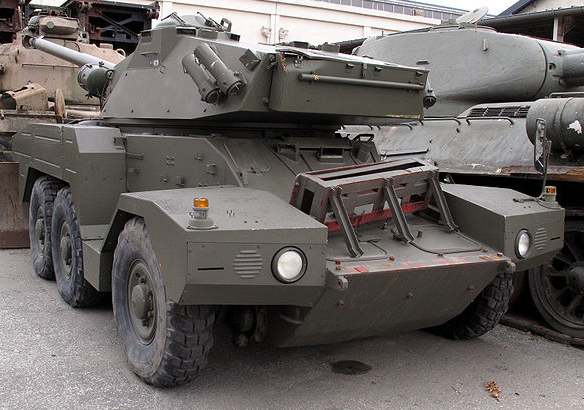 The first prototype delivered in 1977 was based on the VCR and had the Saviem F3 90 mm turret. Since the following versions differed by their turret, we will focus on the chassis and hull, derived from the VCR APC. There were some external differences also between models in this matter, but fundamentally both share most of their components and 6×6 chassis. Historically, the Lynx was the first to be built, as a 6×6 version of the AML since it reused the same Hispano-Suiza Lynx 90 turret already fitted on the Panhard AML 90. The hull was made of welded steel RHA, 10 mm thick overall, with a low center of gravity, and well-sloped front glacis. The driver was located on the left-hand side, with three vision blocks covering the frontal arc, central IR one, and a two-pieces hatch folding on the front and rear. ERC-90 Sagaie front view, turret reversed, Saumur Tank Museum, France. Lights were buried inside the hull bumper at the front. Next was installed the two-man turret (see later), and the engine compartment at the rear, which housed a Peugeot gasoline V-6 Petrol 155 hp revolving at 5,250 rpm for a top speed of 90 km/h and 730 kilometers (450 mi) range, coupled with a 6-front/1 reverse gearbox. For protection, the vehicle received automatic fire extinguishers, collective NBC system with overpressure and air filter (modernized ones have an air conditioning system), plus smoke dischargers on the turret. It is fully amphibious (with propellers and rudders at the rear) and air-transportable, either by the Transall C 160 or Hercules C 130. The central roadwheels are normally raised up for a 4×4 configuration, causing less friction on road. All six had independent coil springs and hydraulic shock absorbers suspensions systems. Field performances showed it was able to climb a 60% gradient, 30% side slope, 0.8 m vertical step, and gap a 1.1 m wide trench. Essentially similar to the Panhard AML late turret, called Hispano-Suiza Lynx 90. This model was large enough for the commander (with cupola, left) and gunner (right), had a main low-velocity CN90 F1 90 mm Tank gun (30 rounds), a coaxial 7.62 mm and AA mounted roof AANF1 light machine-guns with 2000 rounds. Apparently, Argentina was the first to order the new vehicle, 36 vehicles to be delivered to the Marines, for patrols along the border with Chile. Iraq was the first potential customer apparently, with the idea to mount their UTM-800 turret. However this was never realized and instead, the F3 turret was mounted for what became the Lynx. 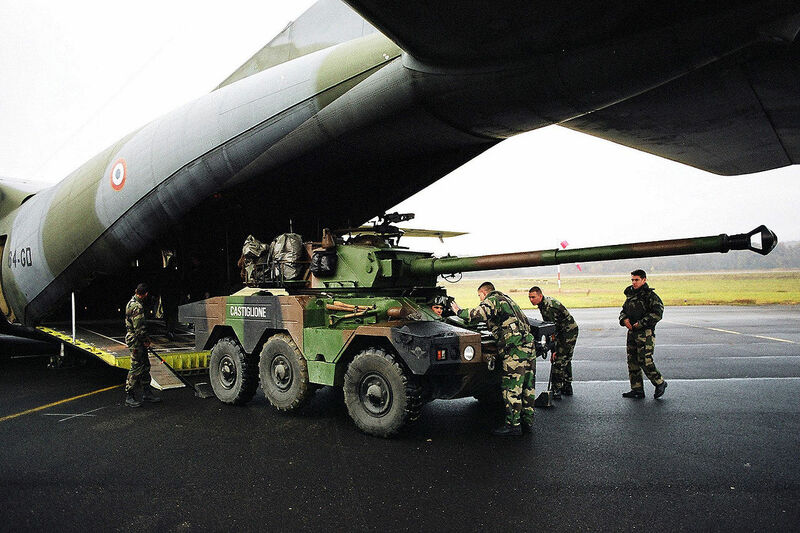 The need for a main gun with more hitting power conducted Panhard to adopt the new F4 CN90 main smooth bore-cannon (from CMI, Cockerill in Belgium) housed in the GIAT TS 90 turret. Although it had a reduced carrying capacity (20 longer rounds), muzzle velocity was much higher and thus enabled to fire APFSDS rounds. It was found capable to penetrate most MBTs from the 1950-70 generation at 2000m. The gunner sight is coupled with a laser rangefinder. The gun also adopted the muzzle brake from the late AMX-13 gun. 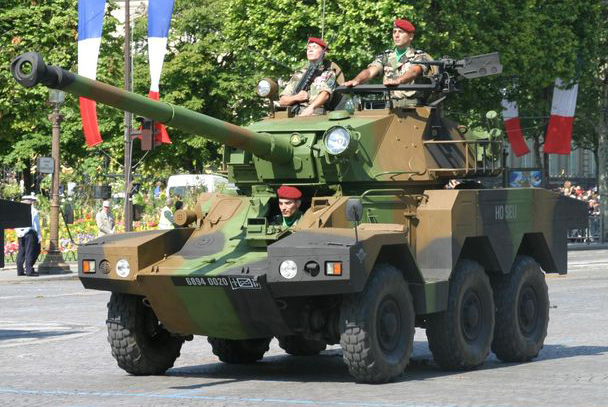 The French Army evaluated the ERC 90 Sagaie from 1978 to 1980 and it was accepted for service in December that year. Still, other trials followed until 1982. Some sources, therefore, state it was in full service by 1984. However in 2005-2009 162 of the 192 in service were modernized. The main focus was to provide a better power-to-weight ratio and greater range. For this, a German MTU diesel (170 hp) was adopted coupled with a new gearbox and Renk transmission. Power-to-weight ratio was raised to 18,7 hp/t (instead of 16.3), top speed to 95 kph and range extended to 800 km. Another contract for the modernization of the turret was also proposed, but never funded. 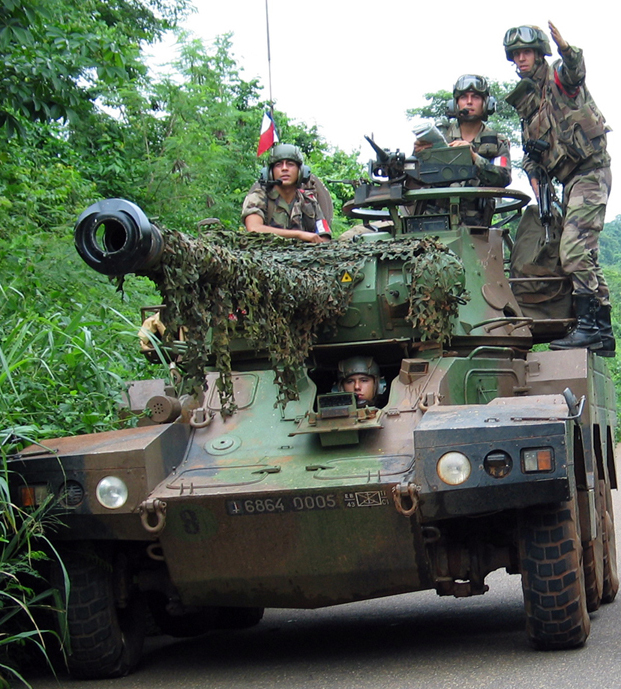 By 2013, still, 100 vehicles were enlisted as active. ERCs are now scheduled for replacement in 2020 by the EBRC program. EMC 91: Fire support version, 81mm mortar, modified Hispano-Suiza EMC turret. 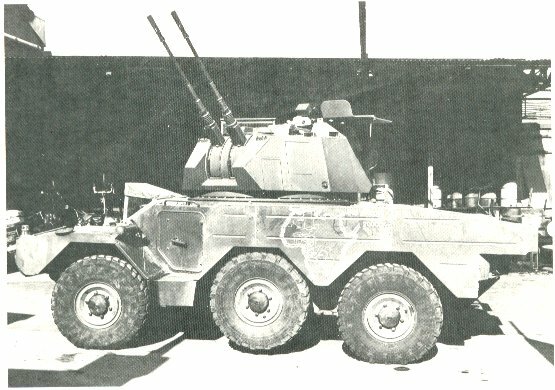 ERC 60-20: Hispano-Suiza 60-20 dual Serval turret, 60 mm mortar, 20 mm autocannon. ERC 90 (Diesel): Diesel engine (experimental). ERC 90 Sagaie 2: Improved version with the same powerplant as the VAB, two Peugeot XD 3T 4-cylinder turbocharged diesel 98hp engines. Gabon purchased six. Another twin-engine prototype tested used Peugeot PRV V6 engines. 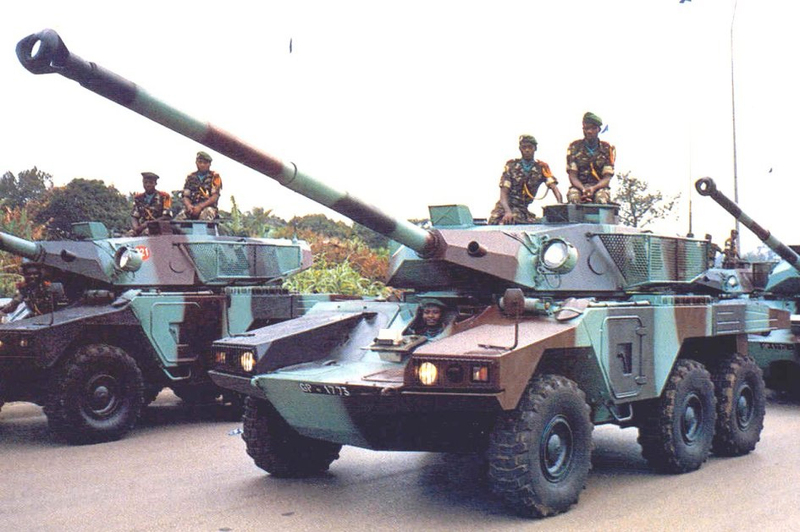 Ultimately the Army will purchase some 192 Panhard Sagaie, but completed the order by the more advanced AMX-10RCs. It will also decline any purchase of the VCR and preferred the VAB developed by Saviem (now Renault Trucks), of which more than 3,500 were delivered throughout the 1980-90s. Despite of this, the ECR gained the same recognition on the export market, being sold (mostly in its Lynx version) to Argentina (14 to the Marine Corps), Chad (4), Ivory Coast (7), Ecuador (10), Gabon (4), Mexico (120), and Nigeria (46). According to Jean-Marc Nesme commission report about military cooperation with Iraq (March 2011), page 12, Iraq received 200 vehicles, delivered between 1980 and 1984 with UTM-800 turrets and were all later either destroyed or scrapped. 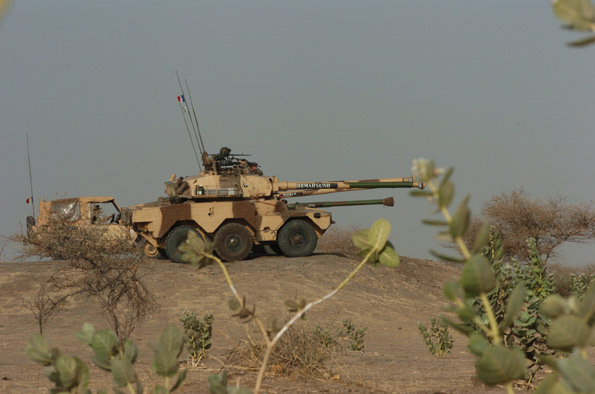 The French Sagaie entered service with the 1er régiment de hussards parachutistes (1er RHP), 4e régiment de chasseurs (27th mountain brigade), Chad unit armored squadron component, and EAABC Saumur cavalry school. It was deployed in Lebanon as a peace-keeping force, also in Kosovo and Bosnia-Herzegovina, in Ivory Coast, Chad, and for a long time with Operation Serval in Mali against Islamic groups MUJAO and AQMI. Also: military-today.com, army-technology.com, wikipedia page (FR), Panhard archives. On of the 13 Panhard ERC-90 Sagaie deployed in the Iraki desert, 1991, Operation Daguet. 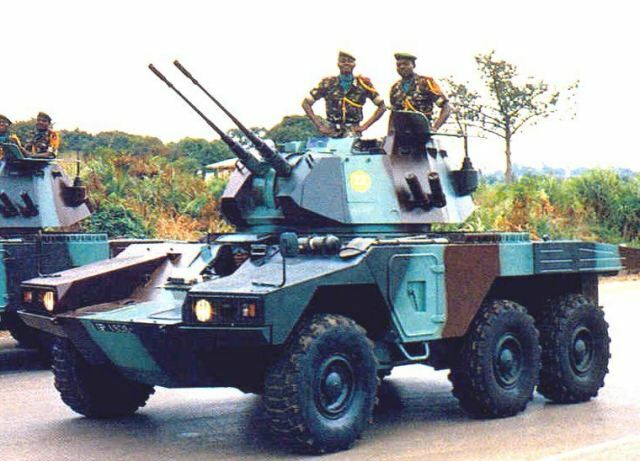 Panhard ERC-90 Sagaie 2 of the Gabonese Army. Mexican ERC 90 Lynx. The biggest user outside France with 120 vehicles, used in the Zapatista insurrection (from 1994). French Sagaie as deployed in Iraq, Operation Daguet. Due to its light weight, air-transportability, the vehicle is equipping the Fast Deployment Force (FDF). Its main drawbacks, however, resides in a weak protection and low power-to-weight ratio. French “valo” (upgraded) ERC-90 with its NATO color scheme camouflage as of today. These vehicles are scheduled to be replaced by the new Sphinx wheeled vehicle from 2018 onwards.